Broadway Arts Lab is New Jersey's premiere Musical Theatre Training program. Offering classes in singing, acting, dancing, music and so much more, Broadway Arts Lab allows students the opportunity to work with Broadway professionals and experience a true theatrical rehearsal process. The Broadway Arts Lab Musical Theatre Intensive is a conservatory-style performing arts program held over the course of one week. Students are exposed to a Broadway inspired rehearsal process, working towards the goal of presenting an original musical revue in a professional theater with lights, costumes, and Broadway guest artists. Students begin each rehearsal day with a complete vocal and physical warm-up aimed at building a strong technical foundation and understanding of the voice, the body, and how they are used in the fine art of musical theatre. Workshops are fun and exciting, learning Broadway-style choreography from current and classic shows, layering in the acting and vocal parts one piece at a time. Students will have the opportunity to work on solo songs, duets, and work alongside, rehearse and eventually perform onstage with Broadway professionals. In addition to our performing arts training program, we also offer Stage Management and Technical training for those students who feel they shine behind the scenes. These "behind the scenes" jobs are equally important to the success of any theatrical production. 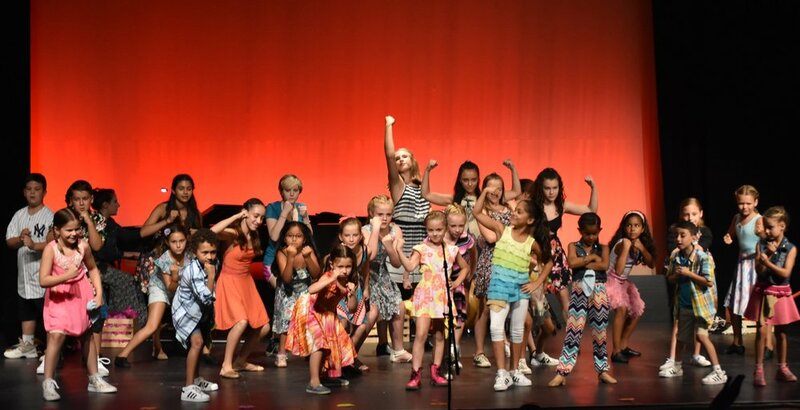 Broadway Arts Lab students are separated by age groups: Super Novas (1st-3rd grade), Rising Stars (4th-6th grad) and Pre-Pros (7th grade and up). Each group works towards the same goal of rehearsing and preparing an original musical revue. Students spend time learning music, songs and harmonies, adding choreography and musical staging with our amazing faculty, choreographers and teachers, and always discuss the acting and character elements of the song in question. On the fifth day of rehearsals, an additional group number is introduced starring a special Guest Artist. All age groups come together for the first time, showcasing what they have learned for one another, and doing a full run-thru in preparation for "Tech/Dress" rehearsal in the theater and the final performance. Friends and family are invited to support our students as they sing, dance and act in an original show, custom created for each individual group of young performers who join the Broadway Arts Lab. Join us for a summertime experience, filled with singing, dancing, acting, and a great deal of fun! BALCO's Musical Theatre Intensive meets at Packanack Lake Community Church located at 120 Lake Dr E in Wayne, NJ. Final Performance at The Rosen Center of Performing Arts located at the Wayne YMCA, 1 Pike Drive Wayne, NJ. Copyright 2010-2015 Anthony Mansker. All Rights Reserved.